Atop multiple indignities and affronts to liberty and democracy visited upon the Arab world by the West, including the plunder of Palestine by European settlers and the political oppression of Arabs by a retinue of military dictators, monarchs, emirs and sultans who rule largely at the pleasure of Washington and on its behalf, now arrives the latest US transgression on the ideals of sovereignty, independence, and the equality of nations: marauders in Washington have pilfered part of the territory of one of the last bastions of Arab independence—Syria. Indeed, Washington now controls “about one-third of the country including most of its oil wealth”,  has no intention of returning it to its rightful owners, has planned for an indefinite military occupation of eastern Syria, and is creating a new Israel, which is to say, an new imperialist outpost in the middle of the Arab world, to be governed by Kurdish proxies backed by US firepower. The crime has been carried out openly, and yet has hardly been noticed or remarked upon. During the war against ISIS, US military planning called for the Kurds to push south along the Euphrates River to seize Syria’s oil-and gas-rich territory. While the Syrian Arab Army and its allies focussed mostly on liberating cities from Islamic State, the Kurds, under US direction, went “after the strategic oil and gas fields”,  “robbing Islamic State of key territory,” as The Wall Street Journal put it. The US newspaper correctly designated the seizure of key territory as a robbery, but failed to acknowledge the victim, not Islamic State, which itself robbed the territory, but the Syrian Arab Republic. But this skein of equivocation needs to be further disentangled. It was not the Kurds who robbed ISIS which earlier robbed the Syrians, but the United States which robbed ISIS which robbed Syria. The Kurds, without the backing of the US armed forces, are a military cipher incapable, by their own efforts, of robbing the Arab republic. The Americans are the robbers, the Syrians the victims. Joshua Landis, a University of Oklahoma professor who specializes in Syria, has argued that by “controlling half of Syria’s energy resources…the US will be able to keep Syria poor and under-resourced.”  Bereft of its petroleum resources, and deprived of its best farmland, Syria will be hard-pressed to recover from the Islamist insurgency—an operation precipitated by Washington as part of its long war on nationalist influence in the Arab world—a war that has left Syria in ruins. The conclusion that “Assad has won” and that the war is over except for mopping up operations is unduly optimistic, even Pollyannaish. There is a long road ahead. Needless to say, Damascus aspires to recover its lost territory, and “on February 7 sent a battalion-sized column to [recuperate] a critical gas plant near Deir Ezzour.”  This legitimate exercise of sovereignty was repulsed by an airstrike by US invaders, which left an estimated 100 Syrian Arab Army troops and their allies dead. The significance of this event has been under-appreciated, and perhaps because press coverage of what transpired disguised its enormity. An emblematic Wall Street Journal report, for example, asserted that the US airstrike was a defensive response to an unprovoked attack by Syrian forces, as if the Syrians, on their own soil, were aggressors, and the invading Americans, victims. We might inquire into the soundness of describing an aggression by invaders on a domestic military force operating within its own territory as a defensive response to an unprovoked attack. Likewise, we can inquire into the cogency of Washington’s insistence that it does not intend to wage war on the Syrian Arab Army. That this statement can be accepted as reasonable suggests the operation of what Charles Mills calls an epistemology of ignorance—a resistance to understanding the obvious. It should be evident—indeed, it’s axiomatic—that the unprovoked invasion and occupation of a country constitutes an aggression, but apparently this is not the case in the specially constructed reality of the Western media. Could Russia invade the United States west of the Colorado River, control the territory’s airspace, plunder its resources, establish new government and administrative structures to supplant local, state, and federal authority, and then credibly declare that it does not seek war with the United States and its armed services? Invasion and occupation are aggressive acts, a statement that shouldn’t need to be made. Washington’s February 7 attack on Syrian forces was not the first. “American troops carried out strikes against forces loyal to President Bashar Assad of Syria several times in 2017,” reported the New York Times. In other words, the United States has invaded Syria, is occupying nearly a third of its territory, and has carried out attacks on the Syrian military, and this aggression is supposed to be understood as a defensive response to Syrian provocations. Let’s look again at Washington’s stated reasons for its planned indefinite occupation of Syria: to prevent the return of ISIS; to stop the Syrian Arab Republic from exercising sovereignty over all of its territory; and to eclipse Iranian influence in Syria. For only one of these reasons, the first, does Washington offer any sort of legal justification. The latter two objectives are so totally devoid of legal warrant that Washington has not even tried to mount a legal defense of them. Yet, these are the authentic reasons for the US invasion and occupation of Syria. As to the first reason, if Washington were seriously motivated to use military force to crush Al Qaeda, it would not have armed, trained and directed the group’s auxiliaries in its war against Arab nationalist power in Damascus. Regarding Washington’s stated aim of eclipsing Iranian influence in Syria, we may remind ourselves of the contents of a leaked 2012 U.S. Defense Intelligence Agency report. That report revealed that the insurgency in Syria was sectarian and led by the Muslim Brotherhood and al-Qaeda in Iraq, the forerunner of Islamic State. The report also disclosed that the United States, Arab Gulf oil monarchies and Turkey supported the insurgents. The analysis correctly predicted the establishment of a “Salafist principality,” an Islamic state, in eastern Syria, noting that this was desired by the insurgency’s foreign backers, which wanted to see the secular Arab nationalists isolated and cut-off from Iran. The United States has since decided to take on the role that it had once planned for a Salafist principality. A planned Saudi-style state dividing Damascus from Tehran has become an indefinite US occupation, from whose womb US planners hope to midwife the birth of a Kurd mini-state as a new Israel. It would profit us to heed the words of Ibrahim Al-Amin, who, on the occasion of the White House recognizing Al-Quds (Jerusalem) as the capital of Israel, asked Arabs whether it wasn’t time to realize that the United States is the origin of all that plagues them. Let us leave ‘Israel’ aside, he counseled. “Whatever is said about its power, superiority and preparation, it is but an America-British colony that cannot live a day without the protection, care and blind support of the West.”  The same can be said of the Saudi monarchy and the SDF. I leave the last word to the Syrian government, whose voice is hardly ever heard above the din of Western war propaganda. The invasion and occupation of eastern Syria is “a blatant interference, a flagrant violation of [the] UN Charter’s principles…an unjustified aggression on the sovereignty and independence of Syria.”  None of this is controversial. For his part, Syrian president Bashar al-Assad has pointed out incontestably that foreign troops in Syria “without our invitation or consultation or permission…are invaders.” It is time the US invasion and occupation of Syria—illegal, anti-democratic, plunderous, and a project of recolonization—was recognized, opposed, and ended. There is far more to Washington’s long war on Syria than Al Qaeda, the White Helmets and the Kurds. As significant as these forces are, the threat they pose to the Syrian center of opposition to foreign tyranny has been surpassed by a more formidable challenge—the war’s escalation into a US military and diplomatic occupation accompanied by direct US military confrontation with the Syrian Arab Army and its allies. 1. Neil MacFarquhar, ‘Russia’s greatest problem in Syria: It’s ally president Assad,’ The New York Times, March 8, 2018. 2. Anne Barnard, “US-backed force could cement a Kurdish enclave in Syria,” The New York Times, January 16, 2018; Domenico Losurdo, “Crisis in the Imperialist World Order,” Revista Opera, March 2, 2018. 3. Gardiner Harris, “Tillerson says US troops to stay in Syria beyond battle with ISIS, The New York Times, January 17, 2018. 4. Robert Fisk, “The next Kurdish war is on the horizon—Turkey and Syria will never allow it to create a mini-state,” The Independent, January 18, 2018. 5. Aaron Stein, “Turkey’s Afrin offensive and America’s future in Syria: Why Washington should be eying the exit,” Foreign Affairs, January 23, 2018. 6. Nancy A. Yousef, “US to remain in Syria indefinitely, Pentagon officials say, The Wall Street Journal, December 8, 2017. 7. Andrew deGrandpre, “A top US general just said 4,000 American troops are in Syria. The Pentagon says there are only 500,” the Washington Post, October 31, 2017. 8. John Ismay, “US says 2,000 troops are in Syria, a fourfold increase,” The New York Times, December 6, 2017; Nancy A. Yousef, “US to remain in Syria indefinitely, Pentagon officials say,” The Wall Street Journal, December 8, 2017). 9. Dion Nissenbaum, “Map said to show locations of US forces in Syria published in Turkey,” The Wall Street Journal, July 19, 2017. 10. Michael R. Gordon, “In a desperate Syrian city, a test of Trump’s policies,” The New York Times, July 1, 2017. 11. Nancy A. Yousef, “US to send more diplomats and personnel to Syria,” The Wall Street Journal, December 29, 2017. 12. Dion Nissenbaum, “US moves to halt Turkey’s drift toward Iran and Russia,” the Wall Street Journal, February 21, 2018. 13. Nancy A. Yousef, “Some US-backed Syrian fighters leave ISIS battle to counter Turkey,” The Wall Street Journal, February 6, 2018. 14. Yaroslav Trofimov, “In Syria, new conflict looms as ISIS loses ground,” The Wall Street Journal, September 7, 2017. 15. Gregory Shupak, “Media erase US role in Syria’s misery, call for US to inflict more misery,” FAIR.org, March 7, 2018. 16. Trofimov, September 7, 2017. 17. Raj Abdulrahim and Ghassan Adnan, “Syria and Iraq rob Islamic State of key territory,” The Wall Street Journal, November 3, 2018. 18. Raj Abdulrahim and Ghassan Adnan, “Syria and Iraq rob Islamic State of key territory,” The Wall Street Journal, November 3, 2018. 19. Abdulrahim and Adnan, November 3, 2018. 20. Raja Abdulrahim and Thomas Grove, “Syria condemns US airstrike as tension rise,” the Wall Street Journal, February 8, 2018. 21. Joshua Landis, “US policy toward the Levant, Kurds and Turkey,” Syria Comment, January 15, 2018. 22. Yaroslav Trofimov, “As alliances shift, Syria’s tangle of war grows more dangerous,” The Wall Street Journal, February 15, 2018. 23. Raja Abdulralhim and Thomas Grove, “Syria condemns US airstrike as tensions rise,” The Wall Street Journal, February 8, 2018; Nancy A. Yousef and Thomas Grove, “Russians among those killed in US airstrike is eastern Syria,” The Wall Street Journal, February 13, 2018. 24. Yousef and Grove, February 13, 2018. 25. Charlie Savage, “US says troops can stay in Syria without new authorization,” The New York Times, February 22, 2018. 26. Savage, February 22, 2018. 27. Stephen Gowans. 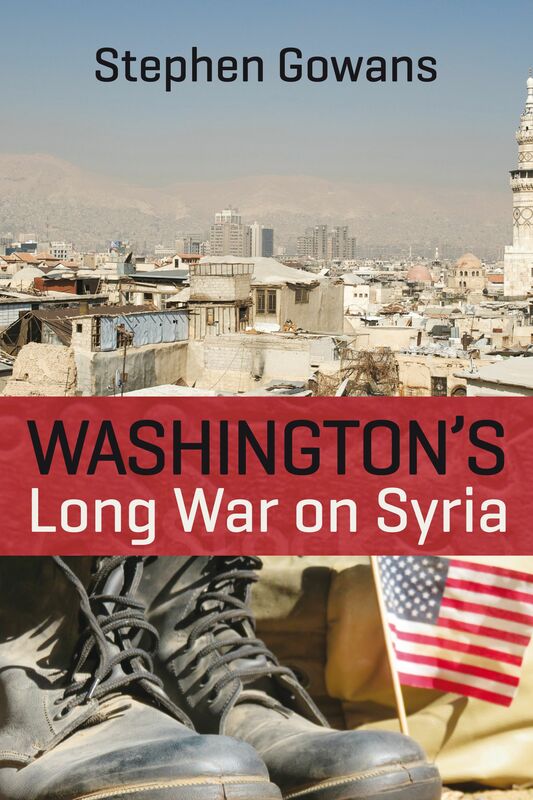 Washington’s Long War on Syria. Baraka Books. 20017. Pp. 149-150. 28. DIA document leaked to Judicial Watch, Inc., a conservative, non-partisan educational foundation, which promotes transparency, accountability and integrity in government, politics and the law. 29. Mark Mazzetti and Eric Schmitt, “Quiet support for Saudis entangles U.S. in Yemen,” The New York Times, March 13, 2016. 30. Stephen Gowans, “The US-Led War on Yemen, what’s left, November 6, 2017. 31. William James, “May defends Saudi ties as Crown Prince gets royal welcome in London,” Reuters, March 7, 2018. 32. Ibrahim Al-Amin, “Either America or Al-Quds,” Alahednews, December 8, 2017. 33. Syria condemns presence of French and German special forces in Ain al-Arab and Manbij as overt unjustified aggression on Syria’s sovereignty and independence, SANA, June 15, 2016.